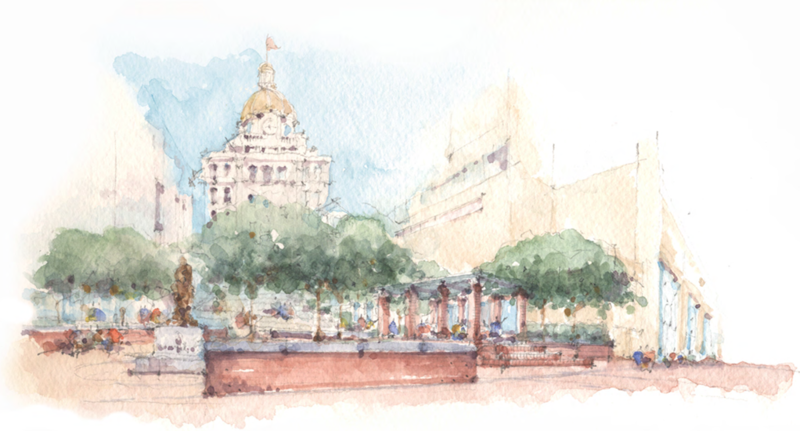 In 2014, the City launched the Downtown Streetscape Improvement Initiative to build on previous planning efforts to revitalize downtown Savannah and create an environment that contributes to its livability and the economic vitality of the community. The City Hall Ferry Landing Shelter is part of the Visitor Mobility Plan developed to enhance the Savannah experience for both visitors and residents by improving downtown mobility. The Ferry Shelter Landing serves individuals waiting for the Savannah Belles Ferry along Rousakis Plaza just behind City Hall as was completed in 2017. The project was funded by Savannah Area Mobility Management, Inc. (SAMMI). The Wayfinding and Directional Signage Program creates a coordinated, user-friendly, visible navigation system in the Historic and Convention districts. The Wayfinding Program was finalized in 2009. Since that time, all municipal parking garages have been signed with the "P" (parking) icon, the four visitor centers have been branded with the "i" (information) icon, new dot stop signs clearly identify all 12 dot fare-free shuttle stops and the River Street Elevator is easily recognized with a new sign. Most recently, 15 directional wayfinding signs were unveiled. The Savannah-Chatham Council on Disability Issues (SCCDI) publishes an Accessibility Guide to Savannah's Historic Districts.This guide highlights organizations, facilities and services that have taken initiative to accommodate visitors with and without disabilities, allowing everyone to truly enjoy the Savannah experience.